Last Friday, we interviewed Prime Minister Scott Morrison after the budget was presented and the election was announced. When asked if he would be so kind as to give us the scoop, “ScoMo”, as he is known to most, politely declined. “The elections will be held in May and will be called in April, so no scoop,” he said between laughs. 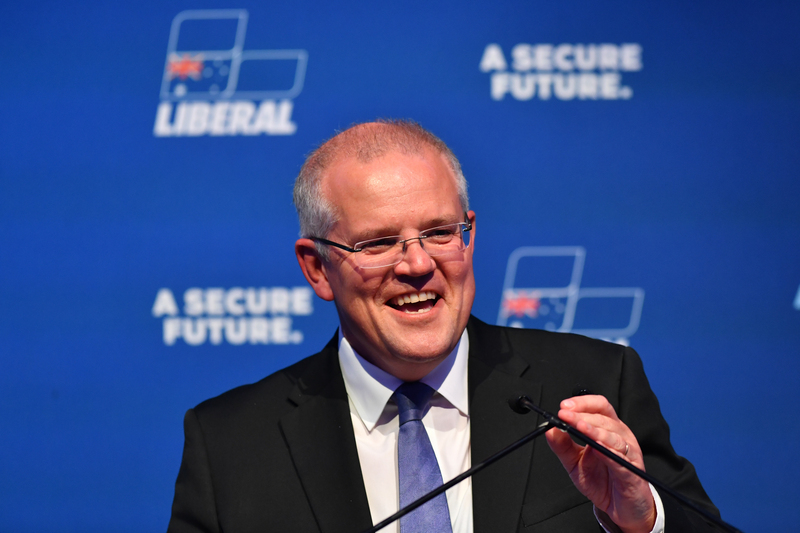 Though Morrison didn’t confirm, the elections will be held on May 18, except in the event of unforeseeable circumstances, given that the 12th is Mother’s Day and the 25th would mean either a longer campaign or one full of pitfalls. The 2019 Budget, presented last Tuesday by Treasurer Josh Frydenberg, has a typical pre-election flavour, with financial relief ($158 billion in 10 years) to be put in the pockets of citizens with an income between $49,000 and $90,000, with $1080 back when it’s time for tax returns (the tax deductions will interest citizens with a salary between $40,000 and $126,000), and an infrastructure plan for roads and railways, including plans for higher-speed trains, with $100 billion to be spent over the next 10 years. Frydenberg also announced the first budgetary asset in 12 years, but essentially, both the Coalition and the Liberals agree: the surplus will arrive next year. At the moment, Australia has a deficit of more than $4 billion, but over the course of 2019 and 2020, the economy will reach a surplus of $7.1 billion. Mr Morrison, I understand you are ready to announce the date of the election, probably by the end of the week. Would you be so kind as to announce it on Rete Italia? The election will be in May and it’ll be called in April. No scoop today, I’m sorry. No, that is a terrible lie. That is not true. That is something the Labor Party has been saying and the only things you’ll hear from the Labor Party are lies... And higher taxes. That’s what the Labor Party will do all through this election; they’re putting taxes up on everybody and telling lies. Every single package, every single thing that is required in the NDIS is fully funded. There’s more demand for the NDIS that will be met. There have been no cuts to the NDIS at all. What we do each year is make an estimate of how many packages we expect to come forward and that’s what we provide for. If there are more packages that are required, more funding will be provided. So, this year there were $3 billion less packages, basically? No, that’s not true. If there are more packages required, they will be funded. This is our current estimate of how many packages we expect to be demanded, but if there are more that come forward then they will be fully funded, and there is no obstacle to any package being funded that is approved through the NDIS. So, the suggestion that there is any reduction in support for the NDIS is a complete and total lie and very, very upsetting lie, because it is causing needless anxiety for families and individuals who rely on these services. What’s being said is completely untrue and I think it’s quite cruel by those who have suggested this from the Labor Party to try and upset people who have disabilities, because they should know well that what they’re saying is not true. We intend to do that because we intend to reverse the Medivac Bill which Labor supported, which has opened up our border security arrangements to a great threat. Because we have to deal with the legislation as it currently appears. We’ll go to this next election and, if we’re elected, we will reverse that. What we’ve been able to do so far is counteract the negative impacts of what that bill was doing, but we can’t be guaranteed of that longer-term and so we didn’t support that bill at the time. We think it undermines Australia’s strong border protection laws and we will always be for stronger borders. I greatly appreciate the great support the Italian community across Australia has given us for our strong border protection position. People have come from all around to live in Australia knowing how important strong borders are. People have come the right way to Australia and have made great contributions. They understand the importance of having integrity in our immigration system and having strong borders. The extension of the one-off energy payment – the $75 for singles and $125 per couple to people on New Start – wasn’t in the paged document. Was it policy on the run? No, no. It was practical common sense to make sure that people got the support they needed. I wasn’t going to allow extending this additional support to be compromised by political game-playing in the parliament. There was a move to see that this be extended more broadly for the community and I was happy to accommodate that. I mean, that’s what you’d expect from a Prime Minister who is just practical and getting on with the job. I wasn’t going to allow this to be hijacked by the Labor Party or any of the other parties. People just want to get the support, and we’re in a position to be able to provide that support because of the strong budget we’ve been able to deliver. And particularly our economic management over the last year; we had the ability to extend it further, and in the interest of seeing the whole measure go forward, I practically supported it. The economy in Australia is quite healthy. We have low unemployment rates and next year we will be in surplus in the budget, but you are still very behind in the polls. The government is not recognised for what it’s doing? Why do you think that is? I think Australians of all backgrounds will focus on these issues as we get closer to the election. I think they will have the opportunity to come to the same conclusion that you have. That is, that the government hasn’t done a very good job in presiding over a stronger economy. Unemployment is at 4.9 per cent. That’s the lowest it’s been in 10 years, and this is a great thing for the country – a stronger economy. And, what I know particularly of Australians of Italian background, is that they’re great small businesspeople and they drive our economy forward. In this budget, we announced that we would be extending the instant asset write-off to businesses up to $50 million in turnover. For $30,000 for all businesses up to that turnover, they get to write off those equipment purchases up to that amount. That comes on top of the 25 per cent tax rate we’ve already been able to legislate and which the Labor Party fought against most of this parliamentary term. I remember we went to the last election promising to cut taxes by 25 per cent for small businesses and the Labor Party opposed us; they lost that election. Then they fought us in the parliament when we sought to implement that, and fortunately we prevailed, but without their help. What about the second phase of that tax reform for the big companies? No, there wasn’t the support for that in the parliament and I don’t believe there’s the support for that going forward, so we’re focusing on those small families and medium-sized businesses and delivering the income tax cuts that we announced in the budget. These are significant income tax cuts initially for those earning up to a middle or lower income, and they’ll be getting a maximum of just over $2100 for families, and that is combined with our other policy, which is to abolish the 30 per cent tax bracket. We’ve already legislated to have that abolished in the future, and we will take the 32.5 per cent tax bracket down to just 30 cents, and 94 per cent of Australians will pay no more than 30 cents on their marginal tax rate. Labor have already said they’re going to oppose that, but I do not believe that should be the marginal tax rate, and that will be for people earning as little as $47,000 a year. I want them to pay only 30 cents tax on that. Labor wants them to pay 32.5 cents, and on those and the next tax … They want them to pay 37 cents. The people who get $200,000 will only pay 30 cents. Is this unfair? No, no. I disagree. What we’re doing is getting rid of bracket creeps: from $45,000 up to $200,000, you’ll pay 30 cents marginal tax rate and it’ll go to the top marginal tax rate at 45 per cent. What we’re doing is ensuring that for most Australians, over the course of their working life, the more they earn won’t push them into a higher tax bracket. They’ll still pay proportionally more tax than everybody else. The lion’s share of income tax in this country is paid by those who earn over about $125,000 to $150,000. That’s who pays the bulk of the taxes in this country, and that won’t change. It’ll still be a fair, progressive system, but for Australians going out there and working hard, I want them to keep more of what they earn. They’re putting it in, and I want the same for small and family businesses because people work hard in this country and they should be rewarded for that. The Labor Party wants to tax them more for working harder. One of the problems that the government has is the energy issue. It doesn’t seem to have a proper idea on what can be done to reduce the cost of energy that is hitting families very hard. No, I don’t agree with that at all. We’ve already had the reliability guarantee which ensures that we get reliable base load power out there and getting to the energy market. That’s what we were able to achieve by the end of last year. We were building the Snowy 2.0. For migrant communities all across Australia, everyone knows the Snowy Mountains Scheme and we’re investing over $1.5 billion to see the true vision of that project realised with the biggest pumped hydro power project going on anywhere in the world except in about one or two countries in the northern hemisphere. This is a huge project, and we’ve got the Marinus Link Project, the interconnector between Tasmania and Victoria, so we can get better access to the very clean hydro power coming out of Tasmania. We’ve got the big energy companies to do the right thing by their customers and make sure they’re not hitting them with unfair late payment fees and fines, and making sure they’re honest with people about the true nature of the packages that they’re offering to their customers, so we’re holding all of them to account. And we’ve got about 4000 megawatts, which is about two times – in fact, a little bit more – than that inside the Liddell Power Station in New South Wales, which will ultimately close. We have a very comprehensive policy. But I’ll tell you what we won’t do: we won’t have a 45 per cent emissions reductions target, which is what Labor is proposing; this will take a wrecking ball to the economy. It’s just going to put the price of everything up. Labor’s got $200 billion of higher taxes, abolishing negative gearing as we know it, putting up capital gains tax, putting up personal income tax, putting up the tax you pay on superannuation. It seems like you are electioneering, so I’ll return to my first question: What is the date of the election? It will be in May. I’m not electioneering. I’m telling your listeners the truth. Labor has a tax on retirees and its $5 billion a year and many of your listeners would be receiving credits that come from their investments in Australian companies and they get a check every year. Thousands and thousands of dollars – and Labor are going to take that away from retirees. It won’t be a good Christmas if Labor is elected: Nonna won’t be able to pay for those presents because Bill Shorten would’ve taken her present money. Well, the budget is a plan to grow our economy: we’ll get taxes down and support small family businesses, employ 80,000 apprentices back and into the system and invest $100 million dollars in infrastructure. It’s a plan for our economy, and as people go to the polls in May, what they will be thinking about is what the next decade is going to look like. How much tax am I going to have to pay? How will my small business go under all those other taxes from the Labor Party? We need to keep our economy strong going forward because that’s the economy your kids are going to have to get a job in, or you’re going to have to pay school fees in, or you’re going to have to try to get an apprenticeship in. We’re making the economy possible, where all of those things can happen. And what Labor is proposing will slow our economy and weaken our economy. So, I think there’s a very clear choice. This story appeared in the Monday April 8, 2019 edition of Il Globo. Riccardo Schirru is a journalist at Il Globo and La Fiamma, specialising in federal news and providing a weekly social commentary on current affairs. Olivia Jenkins is studying a Bachelor of Arts with a major in Journalism and a Diploma in Italian at Monash University.